The default mobile calendar may seem like one of the most mundane apps on your phone, but there are dozens of startups aiming to help people better manage their work meetings, personal appointments and social calendars. The latest is UpTo, a Detroit startup that began life as a social network and is relaunching as a social, connected calendar app for iOS on Thursday. UpTo is merging the need for a better calendar with its original premise, which was to create social connections around activities and events. In addition to syncing with Outlook, iOS Calendar, Google Calendar and Yahoo Calendar, users can follow streams of activities and RSVP or talk about the event with friends right in the app. Building a truly modern, connected calendar is not an uncommon goal — new takes on the mobile calendar are everywhere. UpTo co-founder and CEO Greg Schwartz knows it’s a somewhat crowded marketplace and understands why so many are racing to improve this area of productivity. The calendar “is a technology that hasn’t evolved or kept up with our lifestyle or changes in technology,” Schwartz said in an interview this week. “For the last several decades your calendar has been a list of your appointments and meetings” even on our always-on, connected devices. Like Instagram with photos and Waze with maps and GPS, a networked version of the calendar “is so much more powerful than what comes packaged in your native phone,” he said. Plenty of calendar apps have shown us this: Sunrise Calendar integrates Facebook and Foursquare, Donna is a calendar that acts like a personal assistant, and Google(s GOOG) has added Google Now to integrate everything into your list of appointments and events, just to name a few. UpTo is trying to fit somewhere in there by also providing activities that you can join. By following an activity stream you’ll get events inserted into your calendar. If you want attend, you tap the “I’m in” button and it appears like a calendar event. There are hundreds of streams of activities to choose from, which UpTo works with businesses to publish. I picked my city’s weather forecast, my favorite MLB team’s schedule, and a list of book releases to follow. You can also follow famous people like President Obama, and you’ll get a schedule of events he’s appearing at, or your favorite band or music venue, or — and this is really useful — your kid’s school schedule, if the school has published theirs to the app. The user interface is easy enough to figure out — swipe left to remove events, click on the “+” to add an event manually, tap the top bar to move from day to month view. 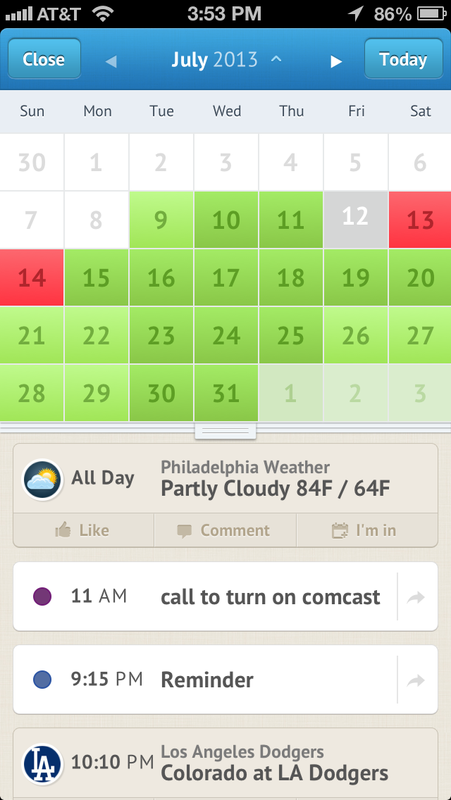 A cool design touch is a color coding on the month view that uses red to show you your busiest days and dark to light shades of green and yellow to show you slightly less busy or open days. It’s a nice way to see with a quick glance how full your schedule is. What’s pretty clear after using it for a bit is that if you don’t want your calendar to be completely overloaded, you have to be extremely picky about what streams you follow. This app will be most appealing to someone who’s looking to be kept up to date on events, and but may be overwhelming for users who want to keep their calendar as uncluttered as possible. It’s iOS-only(s AAPL) for now, though an Android(s GOOG) version of the app will arrive in the next few days, Schwartz said. Because UpTo makes its money from selling white label versions of its social calendar to businesses, both iOS and Android apps will be free to individual users. Agreed. I think while they are doing really well, they jumped over to the other side of the fence with apps like Sunrise that are just trying to make calendaring easy. There are so many startup approaching this question. But this is not the one that cracking the nut. So excited about UpTo 2.0!! 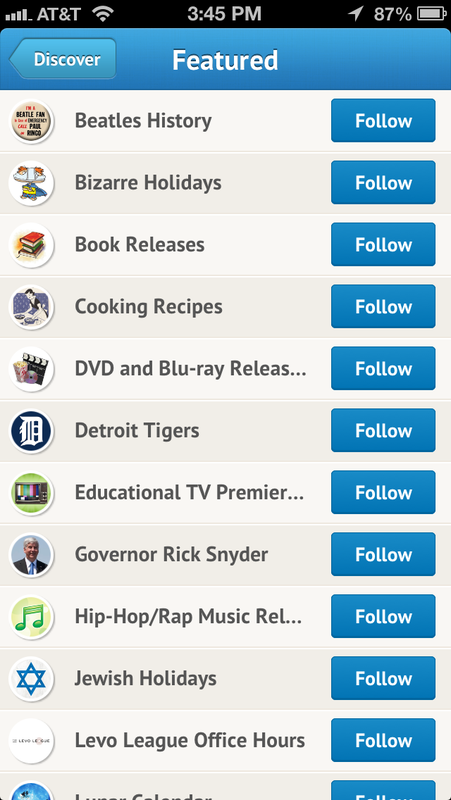 I follow a ton of streams (71 to be exact), and with the original UpTo, clutter was def starting to become an issue… I’ve been beta testing the new app for a few weeks now, and I can confidently say that with the new swipe-to-hide feature, it’s super easy to narrow down events to just the ones you want to see. The result: a robust, clutter-free calendar + I always know when cool stuff is happening around me! I’m actually using the app on Android right now…Love it!